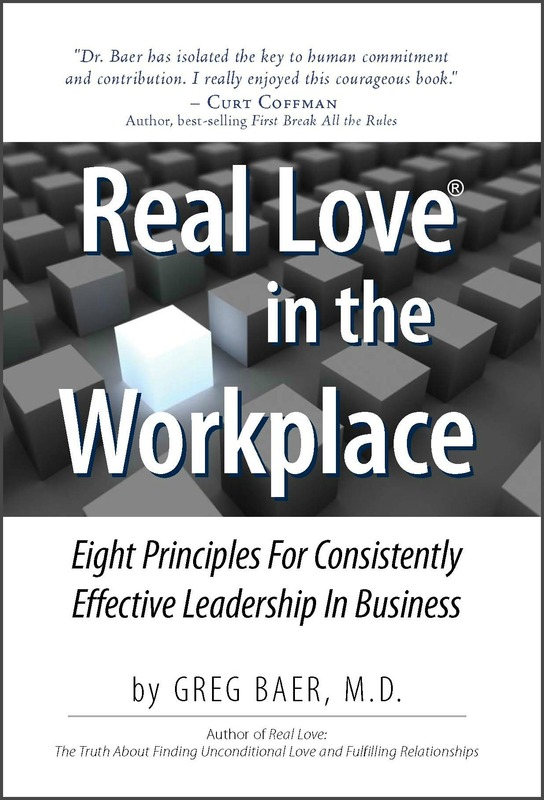 Real Love in the Workplace: Eight Principles for Consistently Effective Leadership in Business, by Greg Baer M.D. We’re all instinctively aware that every human being has a primal need for love, but most of us fail to realize that this need continues into the workplace for every manager, direct report, CEO, vendor, consultant, board member, co-worker, and customer. If we don’t address that primal need, all our attempts to optimize business indicators—productivity and profitability, for example—will be frustrated to a significant degree. If we do address that uniquely human need—if we do what’s necessary to produce happy employees, managers, and customers—profits will naturally follow. how to become the kind of leader people will want to follow. how to create customers who are not just satisfied but eager to stay with your company. how to create a work environment where employees are communicative, creative, cooperative, and happy. how to eliminate—not just manage—conflict in the workplace. how to correct behaviors in a way that people will be eager to hear it. Real Love in the Workplace is also available for the Amazon Kindle here. Copyright 2014 The Real Love Company, LLC. All Rights Reserved.